DUMBARTON produced a battling performance but not a victory against a talented Livingston side in a seven goal thriller at the Bet Butler Stadium. DUMBARTON produced a battling performance but not a victory against a talented Livingston side in a seven goal thriller at the Bet Butler Stadium in front of a 750-strong crowd. With Sons having won five of their previous six games and Livingston going for promotion a good contest always seemed likely — and so it proved. There were chances at both ends in an even first half, with Bryan Prunty coming close with a delicate chip which hit the bar, but just before the interval a fine move saw ex-Son Iain Russell beat keeper Jamie Ewings with a good shot. Two minutes into the second half the Lions were 2-0 up, Stefan Scougall netting after Anthony Andreu beat the offside trap, although Ewings was convinced the goal should have been ruled out. Midway through the half Mark Gilhaney brought Sons back into the game with a powerful shot from distance, but the visitors increased their lead through Russell and Jordan Morton. Sons replied with two late goals — an Alan Lithgow header and a Bryan Prunty piledriver — but had no time left for an equaliser. The teams left the field to a deserved standing ovation. 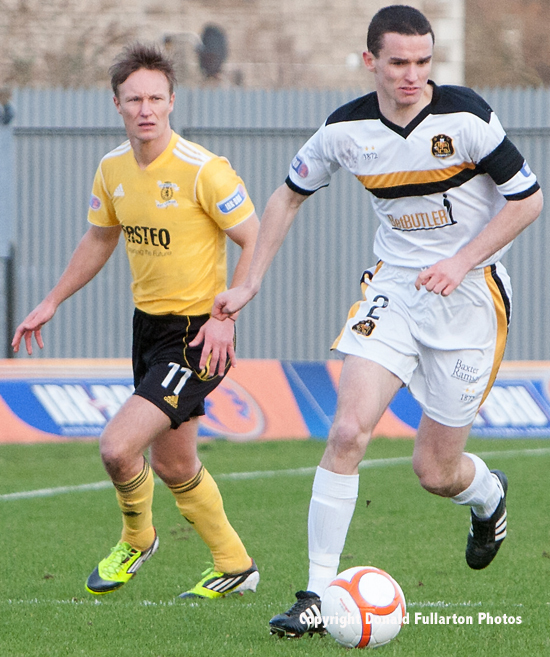 The picture shows new loan signing Paul McGinn, grandson of Dumbarton man and former Celtic chairman Jack McGinn, moving away from Iain Russell.